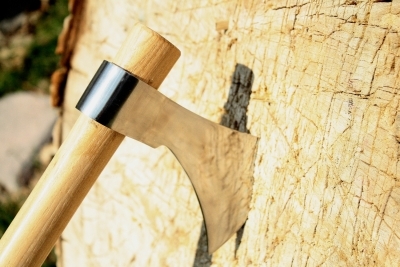 Thrower Supply supplies high quality & authentic products such as hand forged throwing tomahawks, axes and knives. We're based in Springville, Utah, but our hawks can be seen throughout the world. We've supplied hawks to TV shows such as "Are You Tougher Than a Boy Scout? ", to organizations such as the Boy Scouts of America, and many government military groups. Our goal is to grow the sport of tomahawk throwing. We want to see every Boy Scout group (and girl scout group for that matter) throwing hawks. We want to see more hawk throwing and less people cooped up in their homes playing video games or watching TV. Our goal is to sell more tomahawks so more people will enjoy the outdoors. Our tomahawk heads are hand forged iron built for durability under the tutelage of beginner and professional hawk throwers alike. You will notice at first glance the hammer marks of our experienced blacksmiths as they shape the heads. Some of our tomahawks heads go through an additional stage in manufacturing called polishing. These polished hawk heads are easily identified by their shiny silver look and smooth feel. Our tomahawk handles are turned here in the United States out of straight grain American Hickory wood. our handles are also unique in that they are sanded and then put a coat of wax to protect, preserve, and provide a better grip than other handles. Why out of hickory wood you ask? Because it is a solid wood that is ridiculously cheap to replace!